This morning I read a stunning piece by Boze Herrington in The Atlantic. Titled “The Seven Signs You’re In a Cult“, it’s a first person account of religious life grown inward, paranoid, and exclusionary. The power of the piece comes from Boze’s initial excitement with being part of this small group who devoted such time to prayer and then seeing that wane as he becomes increasingly concerned with emotional and spiritual abuse going on in the group (prompted by its leader, Tyler). The story opens with the news of the death of Tyler’s wife Bethany (initially claimed as suicide but now investigated as murder). Reading the piece, I was immediately reminded of Jon Krakauer’s excellent yet unsettling Under the Banner of Heaven. Krakauer’s book tells of how two brothers, members of a fundamentalist polygamous Mormon group, acted to kill the wife and child of one of them. Even though it’s been years since I read Banner, there were striking parallels to Boze’s story: a tight knit group suspicious of outsiders, special revelations, the prioritization of right belief over all else, and rationalization in light of the cause. Clearly, the International House of Prayer (IHOP) isn’t responsible for Tyler’s system of control any more than it is of Bethany’s death. People make choices. And yet in reading Boze’s story I couldn’t help but focus on the systemic issues that indirectly contributed to the situation. For example, Boze mentions that he was “profoundly impacted by IHOP’s teachings“. I’ve noticed lately how the word “teaching” is used in evangelical circles as somehow distinct from the Gospel (a story last week in Christianity Today referenced a lapsed pastor’s “teachings” being taken down from the webpage). When these theological perspectives or sermon series are elevated, they have an added in-group power that suggests an inside track on “what is really going on“. Tyler’s “revelations” and “discernment” give him unique control over the rest of the group. They became dependent upon his role and he seemed to relish the control. They seem extreme at times (the anti-intellectualism was particularly problematic while at a university) and Boze and others admit to having serious doubts although it wasn’t safe to share them. Tyler’s vision of the world and the task he saw before him was shaped in part by a somewhat dystopic vision expressed by IHOP leadership. That is not to say that they intended anyone to take things to extremes, but the manichean understanding of warfare lays a framework. When one is working to save the remnant of “God’s final people“, it can lead to some slippery ethical stances. To be fair, IHOP had provide some good instruction on what to look for in a cult group. As it happens, these are very similar to what sociologists like John Lofland discovered in the 1970s investigating conversion to cultic religious group (the Unification Church). The Lofland/Stark conversion model begins with an individual who is feeling personal tension, is seeking some kind of religious answer, who has a pivotal life event, develops extreme internal group ties, cuts off external ties, and has periods of intense interaction. All of the Lofland/Stark elements show up in Boze’s story. His story is not unusual from anyone who is transplanted to a new location, struggles with meaning or identity, and is surrounded by a small group that provides meaning and worth. Doubt is suppressed, leadership is followed, poor choices are made. The picture on the left comes from a sociology of religion course I taught over 20 years ago while at Sterling College. I was trying to illustrate the natural growth of a religious group from its founding to successful institutionalization. I had suggested that it was my cult (my class) and we consider what happened each time we increased size from the founding group. We imagined growing from 12 to 24 to 48 to 96 to 198 to 396 and so on. Once we got beyond face to face interaction with the founders (somewhere around 100) we have to start building institutional structures of control: doctrinal orthodoxy, educational processes, ordination, and the like. 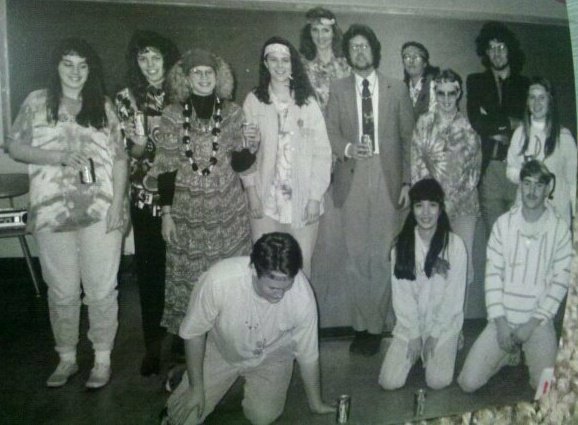 When I came to class two days later, the whole class was dressed like this (I’m not sure why the hippie garb was necessary). My student Joel in the upper right did a remarkable impersonation in spite of being a few inches taller than me. The message was that when support of “our group” becomes primary we wind up making a lot of sociological choices that open the door for bad behavior and rationalization of impropriety. This is part of last week’s fracas on the Leadership Journal piece. It’s part of extreme behaviors of near-shunning in other religious groups. A healthy organization (religious, political, or educational) will recognize the potential for abuse and find ways of monitoring healthy behavior, of encouraging those who feel “something is wrong” to speak up, and to extend the benefit of the doubt to those who think “otherwise”. It seems to me that our community was not exceptional, given the high-intensity spiritual environment we were part of. Tyler was not an isolated individual, but the product of a phenomenally twisted system…. But it is clear that when Bethany died, she was part of a community shrouded in fear and hatred, a community where those who spoke out were treated as though they didn’t exist. Their loves, desires, opinions, feelings, and whole personalities were invalidated, all in the name of God. Communities full of fear, distrust, warfare will give rise to people like Tyler. Instead, a broader understanding of the diversity in the Body of Christ and the activity of the Holy Spirit in our midst is what makes for healthy groups that put the Kingdom of God above their own interests. « Why Am I Not the Leadership Journal Guy?